Riding dress of grey cloth. Caroline hat. Neoclassical costumes. Home » Riding dress of grey cloth. Caroline hat. 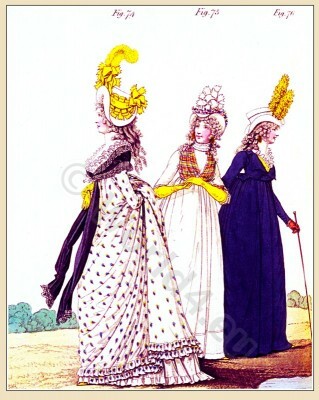 Neoclassical costumes. Riding dress of grey cloth. Round gown. Caroline hat. The hair dressed in light curls; the hind hair turned under, and the ends returned in ringlets. Caroline hat of white satin, trimmed with yellow satin riband; yellow feather placed in the front bow. Round gown of muslin, embroidered in colours; long sleeves; double flounce at the bottom. Double trimming round the neck. Black satin cloak, trimmed with broad black lace. Jonquille coloured gloves and shoes. The hair in curls and ringlets. White patent hat made of raw silk, trimmed with plaid silk, scalloped, and white riband. – Round gown of India long cloth; short sleeves, trimmed with lace; a broad hem and tuck at the bottom. Two rows of full plaiting round the neck. Yellow gloves and shoes.